Ricky Ramirez and Bp Wagon Train post the second fastest time following a 1 � length trial victory. OKLAHOMA CITY, OK�MAY 10, 2013�The first five have qualified for the $1,000,000 Heritage Place Futurity from Friday trials at Remington Park. Two of the top five, are sired by full brothers and leading sires PYC PAINT YOUR WAGON and IVORY JAMES. Second fastest qualifier BP Wagon Train is trained by Trey Wood who was the only conditioner to place more than one into the Heritage Place Futurity from the first night of trials. Jockey Ricky Ramirez rode both of the Wood qualifiers. Bp Wagon Train is an Oklahoma bred son of leading sire PYC PAINT YOUR WAGON from the First Down Dash mare Ladys Is First. Owned by Los Primitos, Bp Wagon Train broke his maiden in the Heritage trials with a 1-� length win with a time of :17.343. Bred by Bill Price, the brown colt was a $25,000 September Heritage Place Yearling. Beattie Feathers, who finished second to Bp Wagon Train and garnered the final qualifying spot with a :17.570 time. Kasey Willis conditions the IVORY JAMES gelding for Joe Flores. J. Garvin Kelly and Nancy Yearsley bred the 2-year-old from the Tres Seis mare Fleeting Touch. He is a $35,000 Ruidoso Select Yearling. For a complete list of the five finalists from night one, including times, sires, dams, owns, breeders, trainers and jockeys CLICK HERE. There will be nine more pressure-packed trials for the $1,000,000 Heritage Place Futurity on Saturday evening with the fastest five joining the top five from Friday night in the June 1 main event. 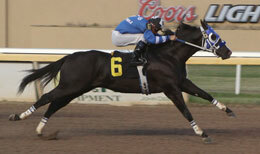 The 2013 Remington Park season continues Saturday and Sunday, May 11 & 12. The first race Saturday is at 6pm with Sunday racing at 1:30pm. Tracked by over 33,000 fans on Facebook and 3,700 Twitter followers, Remington Park is Oklahoma City�s only Racetrack & Casino and is located at the junction of Interstates 35 & 44, in the heart of the Oklahoma City Adventure District. For more information, reservations and group bookings please call 405-424-1000, 866-456-9880 or visit remingtonpark.com.